Meet the team behind the scenes! Nails - I took my nails off! Hallelujah! I just could not deal with them anymore. While I loved the look of them, I was yearning for my natural nails. To my surprise, my nails weren't too badly damaged from the talons I had on! I'm attributing this to the collagen peptides I put in nearly everything. Seriously, even the guy taking my nails off was like, 'Wow, your nails are really strong and healthy.' Since collagen is good for hair, skin and nails, I'm pretty sure that's why my nails weren't in terrible shape. I have both the marine collagen and the regular version. Neither have a smell or a taste, so I just put a scoop in my pre-workout, my smoothie, I'll even bake with it - it's great. I also mix it with peanut butter and give it to my Siberian Husky, Buckles. It's done so much for his joints and coat. Hair - I got my hair done right before Christmas and when given the option between warm or cool tones, I chose warm, not really knowing the difference. I later learned that warm tones are more of a red undertone, which is actually closer to my natural color, but I wasn't crazy about it at first. Now, I don't mind it but I think for the future I'll stick with the cool tones. Skin - I am honestly feeling so grateful because I truly do feel like I figured out the missing link with my hormonal acne. Ever since I started making a serious effort to vary my diet, and all in #allthemicronutrients, I haven't had one breakout. And not only that, but my skin has been really even, the tone is good, the vibrancy is good, and there hasn't been a hint of inflammation. Pretty amazing. I think the true test will be when I start all the travel I have lined up. I'll be going to Panama in February for a little work/birthday trip, and then in March it gets crazy - San Francisco, Los Angeles, Dubai and Hawaii. Eeek! I've discovered that food prepping has been saving me a bundle of money. I think part of the problem was that I was going shopping daily for food - for some reason that made more sense to me because I thought I was buying just what I would use that night. It turns out I was making impulse purchases, and then not taking into account the fact that I had a little leftover of this side, a little leftover from that side, and I was just wasting food. Over the last few weeks I've been experimenting with shopping twice a week (sometimes three times) and doing a big food prep on Sundays. That can usually get me through until Thursday, and then I buy food just to get me through Thursday and Friday. On the weekends, I just kind of eat whatever and call it a day. So anyway, here's what I've been eating lately. 1. Breakfast scramble with an audience! - 1 egg, 2 egg whites, a hash I made out of onion, zucchini, summer squash and purple jewel yams, some red kale, and yellow pepper. 1 piece of Canadian Bacon, which was sent my way via US Wellness Meats. Huge fan of their stuff - everything is pastured raised and grass finished, which is really hard to find! 2. Lunch - I normally tend to steer clear of wraps because they can be heavily processed and contain gut-irritating ingredients like emulsifiers, but we had them over the weekend for a fun dish we made, and I had some leftover. I'd rather finish up the wraps rather than throw them out, you know? These wraps weren't terrible - they were just organic flour, water, and guar gum (that's the emulsifier, but again, it's a once in a while thing, so meh). Anyway, on top I had jasmine black rice, broccoli cooked in bone broth, and chicken breast from US Wellness Meats that I seasoned with BBQ Rub from primal Palate. 3. Breakfast scramble on a wrap - 1 egg, 2 egg whites, kale, yellow pepper and Canadian Bacon from US Wellness Meats. 4. Daily Harvest Overnight Oats - So Daily Harvest sent me a few sundaes, overnight oats and smoothies to try, and I was really into them. 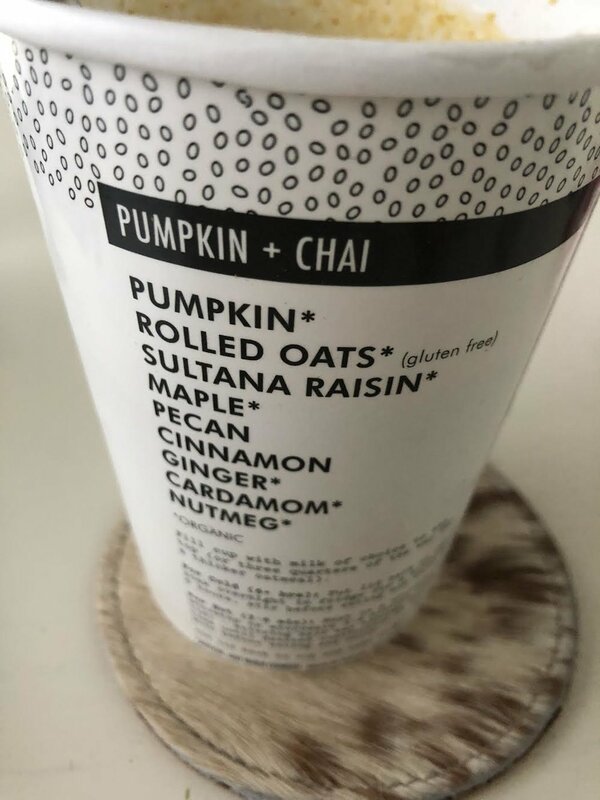 Each product I tried was really good, and I liked that they listed the ingredients right on the back, many of which were organic, and I appreciated that they weren't too sweet. I feel like everyone adds sugar to everything these days, and I've been making a solid effort to cut as much unnecessary sugar from my life (I even quit adding it to coffee!! ), so this was a huge plus. If you want to give Daily Harvest a try, I suggest you make sure to grab the salted caramel sundae (INSANELY GOOD! ), and use coupon code yogabycandace for your first three items free! 5. Over the weekends, I've been making more of an effort to get out of my kitchen comfort zone and try new recipes. I recently made a galette which was no easy feat. I used a mandoline slicer to do the potatoes, which I think is a key component to getting them the right width. I followed this recipe, although I don't think it was the world's best written recipe, but I'm no Martha, so what do I know? 6. 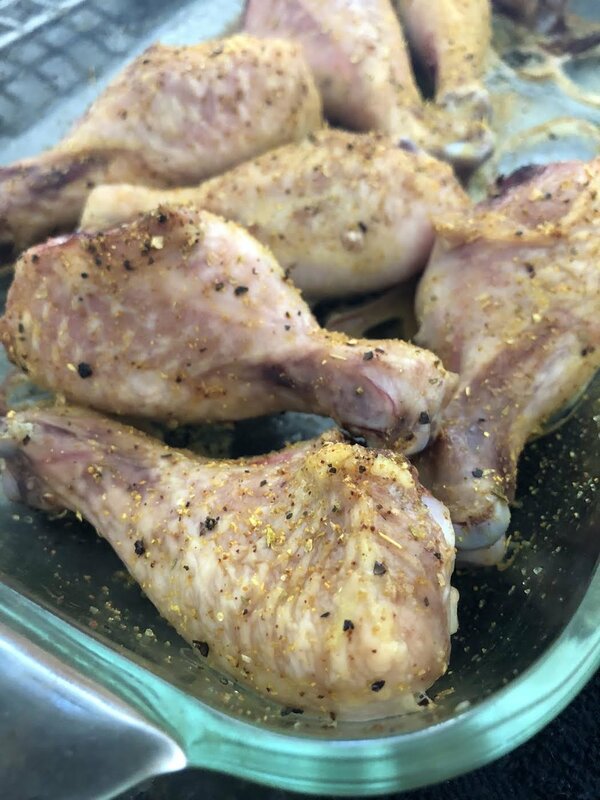 For meal prep, I made up the drumsticks sent my way from US Wellness Meats, which I seasoned with Adobo from Primal Palate, and then baked. 7. For another light meal I had a salmon burger (so good!) and green beans. Literally took five minutes to cook and some days, you just need a quick meal! Toilet Paper - Toilet paper is the most incredible invention ever, you should try it! JK JK I'm not discovering toilet paper for the first time, but I did just discover Grove Collaborative. They sell natural household products below retail, and they mailed me a package of a bunch of goodies the other day including toilet paper, glass food storage, and some cleaning products. They're offering my YBC® fam some love with $10 off your order when you use this link. Fresh Flowers - A friend's sprinkle is taking place next weekend and I'm in charge of the tablescape. I'm not the world's best entertainer - it's actually something I'm really working on this year, which was the motivation behind the cheese board post I did. In terms of decor, I know what I like when I see end results, but I'm not great at picking out one piece at a time to create a cohesive look. I have to work backwards with the final look in front of me so I know what to get and how to arrange the flowers and set the table, etc. Anyway, last weekend I wanted to get the flowers and put everything together. I knew the flowers wouldn't hold up until the sprinkle, but I just wanted to be sure it'd look ok together and I figured in the meantime I could just use the little arrangements around my office and house. I forgot what a difference it makes to have fresh flowers and plants around! I feel like it really changes the energy of a room! I used to buy fresh flowers every week when I lived in Germany and somewhere along the line I just stopped. I loved having this little guy on my desk all week! Body Oil - I love body oil after a shower. Oil seems to hydrate my skin better than lotions, so when I received this body oil from my mom for Christmas, I was psyched. The cardamom and rose scent is SO good. I can't find it online, but they also make it in sacred incense which sounds incredible if you love patchouli (and I do!). Tracking My Workouts - I'll do a more in-depth post on this if you're interested (lemme know), but since January 1st (#resolutions) I've been tracking my workouts. I have a photoshoot coming up in February so back in December I started amping up my workouts just so I'll feel really good for this shoot. Then, when January came along, I decided I should really take a closer look at my workouts and see if planning them might make more of an impact. Turns out, it does. In hindsight, duh, of course it does. I was cherry-picking my workouts. Only occasionally working on my weaknesses. I felt good overall about the workouts themselves, but I felt like the order in which I do them might make my training more efficient. Anyway, to do all this, I picked up a teeny tiny blank datebook. So far, it's been tremendously helpful in holding me accountable and making sure I do the things I don't want to do (like pull ups, woof), so that I decrease my changes of injury related to weakness, and so that I have more efficient, quality workouts. Like I said, I'll go more in-depth with this in a future post, if you are interested. Protein Powder - Just in the interest of staying up to date with what's out and about, I picked up these two single servings at Whole Foods the other day. They have the cleanest ingredients I could find there. The chocolate wasn't great (had a terrible aftertaste), and I haven't tried the vanilla. Will keep you posted. On the Quest for Unsweetened Granola - In other grocery shopping news, I have been on the hunt for a quality granola I can snack on that does not have a lot of BS ingredients. I don't want any sugar in my s#it! Why is that so hard to find?! I've recently cut unnecessary sugar in my diet (even from my coffee, which I never thought I could do), and since I've been focused on sugar, I've been paying attention to labels lately. With the way I eat granola (usually a topping to a smoothie I've blended with yogurt, collagen peptides and frozen fruit), I feel like I get the sweetness from the fruit of the smoothie so I don't want more, you know? Anyway, it turns out it's really difficult to find a granola that is a) decent for the gut to digest, b) doesn't contain blah ingredients, and c) doesn't have added sweetener. This is the only one I could find. I think I might just have to make my own. I ordered a bunch of books per the YBC® Community recommendations from this post. I'm currently reading If the Creek Don't Rise, which is pretty entertaining so far. I also got You Do You, which looks like a motivational read I'm excited to dig into. Schitt's Creek - Episode one of the latest Schitt's Creek is out and I can't wait to watch it this weekend. It is such a good show! My Birthday - My birthday is coming up next month and I'm excited for a little getaway I have planned to Central America. I'm so looking forward to warm weather and the ocean! Teaching - I can't believe how fast this year feels like it's going already! We're not even a full month into the year, but we've got our spring workshop tour planned, and spots are filling up. And in April I'll be in Italy for our week-long yoga retreat (still spots open!). I can't wait to meet you all on the mat. After that, my summer will be spent mostly in Thailand, while I focus on the teacher training, and then we'll be embarking on the fall tour, which Lauren is working on right now. Movies - I have a bunch of Oscar nominations on my list that I'd like to watch, and I am also really looking forward to The 15:17 to Paris. I love that they used the actual guys who stopped the attack. I'd love to hear what's going on with you in your life off the mat. Read anything good lately? What are you looking forward to?! YBC Insiders! Here's your April schedule for the exclusive section of our YBC App! Servin' up the January 2017 content schedule for the Exclusive Section of the YBC app! Things are ca-razy in the best possible way here at YBC, and I'm so excited to share what's been going on!